Let the PC do what it should & finish repeated work to get you more time to live your life! Auto-click without pressing the mouse buttons! Free Auto Clicker can simulate left clicks & right clicks on any screen or window on your computer. It performs the same clicks you recorded automatically when you are not by the computer. It frees you from repeated work that requires a lot of clicking and spare you more time for stuff you are into. Free Auto Clicker is can be used to assist you whenever you need the mouse to be clicked – playing games, using an app without batch processing ability to deal with hundreds of files, voting online or clicking on any types of webpages… You can always count on Free Auto Clicker to finish your clicking job. Free Auto Clicker presents you every feature that may come useful. It shows you the exact X & Y Coordinate of the clicking point. 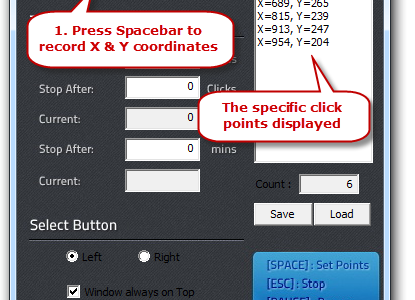 You can record multiple clicking points and save them as a script for later and repeated use. 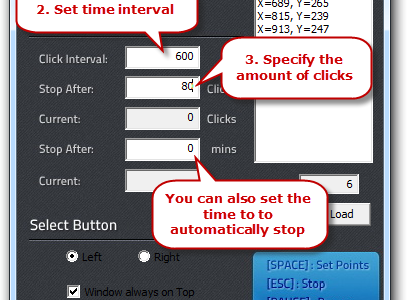 Time interval between each click can be changed and you can even set a schedule to stop the clicking. Repeated clicking can cost you a fortune by damaging your mouse while it is also painful by causing wrist joints numb, swelling, etc. 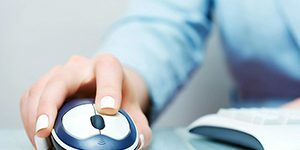 Free Auto Clicker can save your mouse from wear and tear and protect your health so that you will neither need to keep buying new mice nor seek help from doctors. Free Auto Clicker has lived through years of cutthroat competition to become today’s one of the best mouse clicker software. 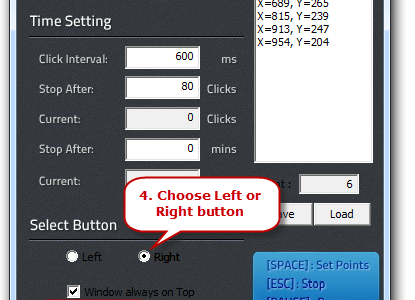 It gives you full control of auto mouse clicks to automate left or right mouse click between a given interval. Free Auto Clicker is handy to automatically clicking your mouse buttons, making mouse clicks faster and more accurate. 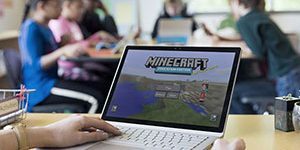 It can simulate left & right click to free your hands from repeating time consuming, repetitive & tedious tasks. 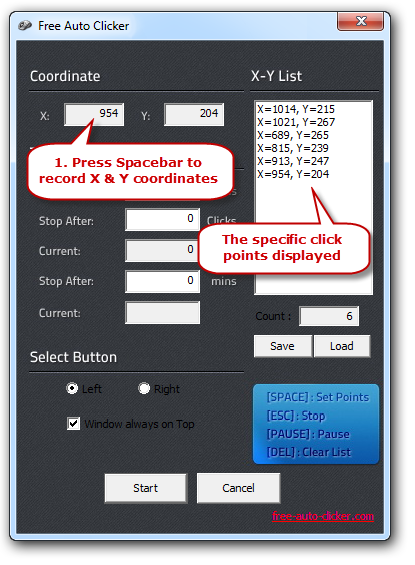 Don’t worry if you don’t the exact X and Y coordinates on your screen – Free Auto Clicker has a coordinate calculator to get X and Y coordinates calculated. Just move the mouse cursor to the place where you would like the program to click, and press the spacebar so that the click at this point can be saved. Free Auto Clicker allows you to record one or multiple clicks. 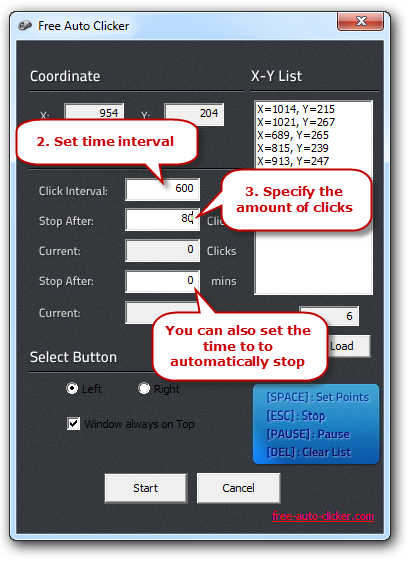 It provides a list of mouse clicks in sequence, where you can use the coordinate calculator to record multiple specific points and then hit Start to click them in order. You can save the list to an FAC file so that you can load it the next time you need the same actions performed. You can set the interval at which the clicks will occur, set pauses between clicks & automatically stop after a desired amount of clicks and time, with the count displayed. It automates the mouse clicks and make scheduling task easier and more accurate ever. If your money is in Stock or Forex market, you are more likely to spend much of your time sitting at the computer to place time-critical orders when the market moves; or you may want to place the last-second bid on eBay when you are away. Free Auto Clicker can make all these happen. 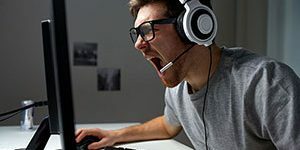 If you are a fan of PC games and online games, Free Auto Clicker also provides you convenience to help you enjoy the games without some unavoidable, irritating & constant clicking. 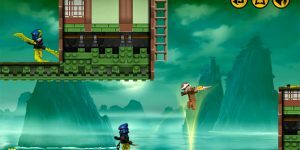 You can go out and spend more time with your friends and families while the computer keeps feeding your pets, mining, woodcutting, fishing, forging a massive amount of equipments like weapons & armors, repeatedly travelling from one area to another, etc. What a fun it is! If you are always surfing on the internet, you may find a lot of web pages that requires you to sit and click for a while to achieve your goals such as online slot machine games, bingo, news and broadcast sites. Also some pages may provide online polls that allow repeat voting. 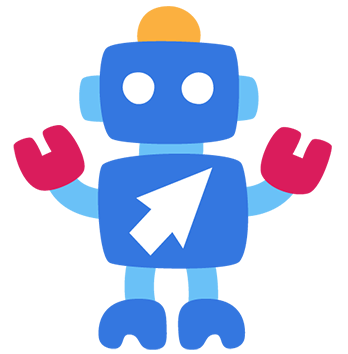 Free Auto Clicker clicks on all of these pages for you without hassle. Some Webcam programs require the users to click to take a picture, making it hard to get yourself into a good pose, since you are limited by how long your arm is and you need to reach out to click the mouse! Set Auto clicker to click on the Take Picture button, and then you just need to focus on your posture. You don’t need to click on the buttons to use Free Auto Clicker. The Hotkeys let you start/stop the auto-clicking, record coordinates and clear the command list. 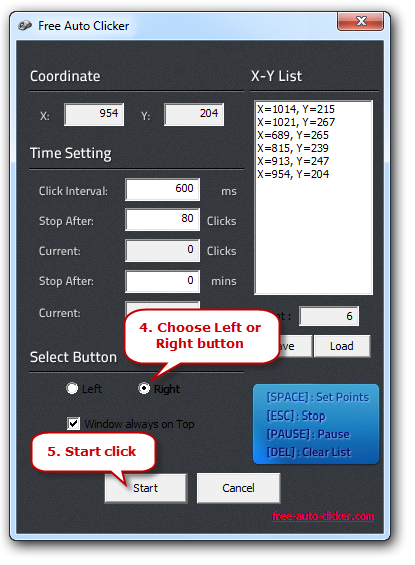 Free Auto Clicker is freeware without the need of register. Anyone who has downloaded & installed it can have permanent free update and free technical support. Free Auto Clicker is 100% clean and safe for all computers. It comes without any disturbance of adware, spyware, malware and viruses. Free Auto Clicker is suitable for all kinds of users, whether experienced or not. It provides hotkeys to control all actions. It also has fine control over clicking repetition, duration and interval. All you need to do is to input the number. If needed, you can also put the window on top of the others.